Cleared up another small matter at the Galas show that had been bugging me for a little while. I was seated at a table with composer/writer Mark Grant who was covering the concert for New Music Blog (not sure how reviews are posted there; maybe just added atop). He described his work in some general terms that prompted me to guess a comparison to William Bolcom might not be out of line; apparently it was at least minimally accurate. I mentioned being very fond of his "Graceful Ghost", a piece I wrote about here a month or two ago. Mark asked which version. Inveterate readers will recall that I was somewhat bemused by the violin/piano version on the recording in question. In my head I was positive I was hearing a solo piano rendition and I was reasonably sure I wasn't fabricating it out of thin air. Mark mentioned the other two sections of the "Ghost Rags" suite, "Poltergeist" and "Dream Shadows", both titles striking memory chords. I knew I must have it somewhere, presumably as part of a multi-composer album and filed elsewhere. 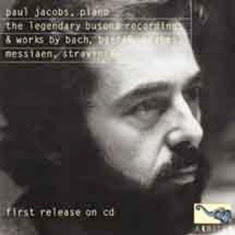 A bit of brain-racking on the way home gave me the answer: a wonderful 1980 release on Nonesuch, "Paul Jacobs plays Blues, Ballads & Rags" on which the pianist (who died of AIDS in 1983) performs the Bolcom suite in addition to Copland's "Four Piano Blues" and (my initial reason for purchase) Rzewski's great "Four North American Ballads". Well, that solved that! It's spinning at the moment and sounding fantastic, the solo Bolcom especially far, far outpacing the version with violin. I'd always meant to hear more Jacobs, a beautiful player, who premiered works by Stockhausen, Messiaen, Berio, etc. Any recs would be appreciated (the above pic is from a recording of Bach Cantatas and other pieces). I'm pretty sure this recording (the Rzewski/Bolcom/Copland one) has never been discafied, a shame. Although the Bolcom, Copland and Rzewski record hasn't been released on CD (AFAIK), three other great Jacobs records from the Nonesuch era have been re-released as a two-disc set on the Arbiter label. The first album is piano etudes by Messiaen, Bartok, Stravinsky and Busoni, and the second is choral preludes by Bach and Brahms, arranged by Busoni, and the third is Busoni's Six Sonatinas. The cover picture you have is from this set (at least as pictured on Amazon). The whole thing is available on emusic and iTunes as well, and is highly recommended.